My first website launched in 2010. I remember the feeling of excitement as my business could now be found on the world wide web by customers all over the world. I imagined the phone ringing off the hook, more customers than I could handle and making my first million by the end of the year. 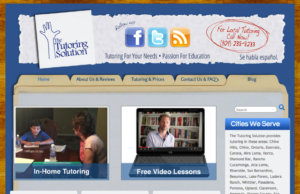 My sister and business partner, Lacey built The Tutoring Solution website. Fortunately for me she installed Google Analytics so we could track exactly how many visitors we had coming to our website. At the end of the week, I saw my website had three visitors – likely my Mom, Dad and brother. The harsh reality set in – this was going to take more work than I thought. I heard blog writing could help get your website ranking in the search engines so I committed myself to writing a blog post every day for six months. My website starting showing up in the search engines, my phone began ringing off the hook, I took on more customers than I could handle and while not yet a millionaire, my businesses have averaged 50% growth over the last seven years. Since that first website, Lacey and I have set up, built and executed blogs for ourselves, for companies we represent and helped new business bloggers get started with theirs. Blog writing has grown my business, but it’s also become a critical tool for businesses large and small. A good metric to determine the importance of blogging in the global marketplace is to see where marketers are spending their time, efforts and money. Marketers and decision-makers both agree about the importance of online content in the sales cycle. To thrive in today’s environment, a digital marketing campaign is critical. Learn why having a business blog is important, how to get it started, how to create content, and how to make money from it. On Thursday, Feb. 16 Zeb Welborn from Welborn Media will be speaking through the San Bernardino County Workforce Development Board at the Ontario Chamber of Commerce sharing his Super Simple Secrets to Blog Writing Success. 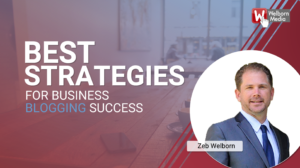 If you miss this engagement, Zeb Welborn will continue to speak throughout 2017 on how to run successful digital marketing campaigns for your business. You can sign up for these free business workshops here – 2017 Social Media Marketing Workshops. Leave comments below: Have you thought about writing a blog, but haven’t started yet? What’s holding you back? Do you have a blog online? What is the url of your blog so we can check it out? Do you have any questions about blog writing? Posted in Blogging, Business and tagged Blog, Blogging, Business.